SINGAPORE (Nov 8): Analysts are putting Singapore Airlines on “hold”, with cloudy skies ahead for the national carrier unlikely to be lifted by the integration of Scoot and Tigerair. SIA reported a 70% fall in 2Q earnings to S$64.9 million as excess capacity and aggressive pricing by competitors depressed yields. Group operating profit declined 15.5% to S$109 million and revenue fell 5.3% to S$3.65 billion for the three months to Sept. Most companies in the group recorded weaker operating results amid a sluggish global economy, with only Scoot and Tigerair bucking the trend. Scoot and Tigerair overturned losses from a year ago to register operating profits of S$5 million and S$3 million, respectively. Singapore Airlines on Friday revealed that Tigerair will be integrated into the Scoot brand under a single operating licence. “From the cost aspect, we believe there will be savings, though to a limited extent, through integration of support functions and touchpoint integration for customers,” says OCBC Investment Research lead analyst Eugene Chua in a Monday report. OCBC is maintaining its “hold” recommendation on SIA, but lowered its fair value estimate to S$10.22, from S$10.80 previously. 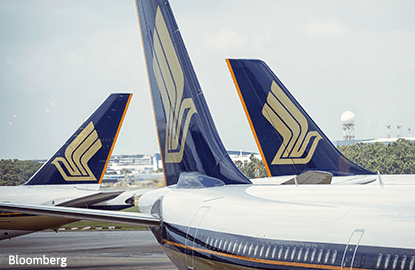 CIMB analyst Raymond Yap says SIA has been “stuck in first gear” for the past year, but the belated move will have “positive repercussions” for SIA. CIMB is keeping SIA at “hold” with an unchanged target price of S$10.47. UOB Kay Hian lead analyst K. Ajith agrees that the integration could “lead to cost savings and incremental revenue”. In addition, Ajith says it could be a prelude to a public offering. According to Ajith, SIA has some S$17 billion of capex over the next four years, and estimates that its operating cash flow will only fund less than half of capex. UOB is keeping its “hold” call on SIA, with a marginally higher target price of S$10.10, from S$10.00 previously. Singapore Airlines is trading 4 cents lower at S$9.93.